Released in June 2017 this comprehensive guide from PB Partners lays out 10 essential actions to record, monitor and evaluate the impact of a PB programme. 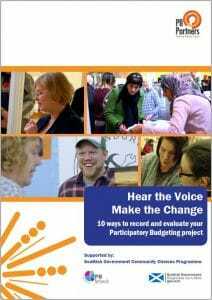 This briefing has been produced in response to Scotland’s Community Choices programme and aims to support public sector organisations wishing to evaluate their ‘mainstream’ Participatory Budgeting (PB) initiatives. The techniques outlined here are also applicable to PB grant making programmes. It complements our recent guides to PB Grant-making and Mainstreaming PB produced in autumn 2016, both of which are freely available in the resources section on this website.